Enter your Zip to find a local buyback event near you! To donate candy to our partnering non-profit for distribution, you MUST complete this form. 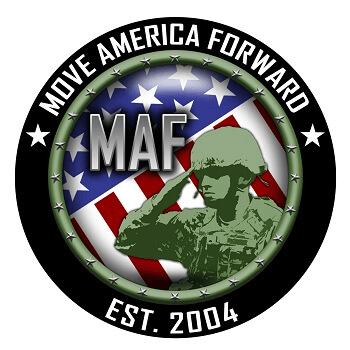 Once completed, our Veteran;s organization will contact you directly for your nearest shipping center. What day should we hold the buyback? Can we use a bathroom scale to weigh the candy? Where do we get the money to pay for the candy? How much money should we expect to go through? What else do we offer the kids? Where can I get Happy Halloween toothbrushes for my candy buy-back event? How do we ship the candy to the Troops? Last year most offices held theirs on Thursday, November 1st including our office, and we ran ours from 3:30pm until 6:00pm. This year many offices will be holding it on the Monday after Halloween and others over the weekend. We will be holding our HCBB on Saturday, November 1st from 11am until 2:00pm. We have chosen to limit the time to a few hours in order to pack all the excitement into a short period of time and to have less disruption during our normal office hours. You can use a bathroom scale if this is your only option, and a larger postal scale would work as well. We borrow a butcher’s scale which is accurate to the hundredth of a pound and of course we round up! How much do we pay for the candy? Some offices accept candy and do not give a financial incentive, and other offices pay $2 per pound. At my office we offer $1 per pound which is the most common among other offices as well. Some offices have sponsors that are covering their expenses but most, like my office, are donating their own money towards this great cause. Last year we collected 700 pounds of candy from 177 kids for $627 Some of the candy was donated, and several children donated their money toward the shipping cost of the candy. We listed the amount of candy collected by all the offices that reported that information to us last year. The list is here. It appears as though the average is approximately 500 pounds although some offices collected as much as 6000 pounds!! Many offices gave coupons for free fries or a free kids meal from a local restaurant. We had three local restaurants donate coupons last year. Make some calls! You’ll be surprised to find many businesses eager to donate. Make sure your sponsors get the publicity and the thank you’s they deserve. 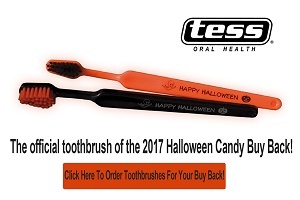 Happy Halloween toothbrushes can be purchased for buy-back events through Tess Oral Health or by calling #1-800-762-1765. For each box of Halloween toothbrushes sold, Tess will donate a free toothbrush to U.S. troops overseas. How do we publicize our Halloween Candy Buyback event? Invite your local media to view it and get an idea of what they could do. Don't wait for media to contact you. Don't wait until tomorrow, get them on board today! I can't stress this enough. Having your event featured on the evening news will generate more interest than you could imagine and help your practice become a household name! Visit our tips page here. How do I add an office to the list of participants or change my listing on HalloweenCandyBuyBack.com? Sign up at https://halloweencandybuyback.com.When you sign up, be sure that the contact person at your office includes her/his email. This will allow him/her to login and make changes in the future. Isn't Halloween candy as bad for troops as it is for kids? The troops are adults and certainly understand how to keep their mouths health by now. Children are still learning how to brush, floss, and take care of their teeth. How Halloween Candy Buyback Got Started? Chris Kammer is a founding member of the American Academy of Cosmetic Dentistry. He has worked as a professional concert promoter, television producer, disc jockey, and more. He has always loved dentistry and media. Dr. Kammer opened Bite Down Productions and ran the company for 10 years. Bite Down promoted big-name bands' concerts, boxing shows, conventions, and had a television show. After having kids, Dr. Kammer gained a new appreciation for dentistry as a great profession and career. He moved his passion for media into his dentistry business. And guess what? He found a huge audience waiting to hear about dentistry! He started a marketing department with full-time marketing director, videographer, graphic designer, and PR specialist in his office. This led him to opportunities in the national media – both TV and magazines. Later, he built a new practice and refocused more toward dentistry. He outsourced his dental practice’s marketing to a respected PR company. The company created monthly promotions for Dr. Kammer. A few years ago, the PR company asked Dr. Kammer what his promotion should be for October. Dr. Kammer is the first to say, he did not invent the idea of a candy buyback at Halloween, but he did think it was a great concept. He and his PR company ran with it, then decided to send the candy to US troops overseas. The promotion worked on every angle! TV, news, radio – they came to Dr. Kammer! The program took on a life of its own. It worked before, during, and after the actual event. In all of his experience, nothing impacted his local publicity more than this single event. Parents thought it was great. Kids got excited. The entire community came together to have fun and support our troops. "This story is after the event. It really was a lot of fun!"